This region is called Bristol Channel since it includes not only the city of Bristol but the areas bordering on the Bristol Channel (north Cornwall, north Devon, Gloucestershire and South Wales) and the hinterland south of Bristol (Bath, north Somerset and north Wiltshire). 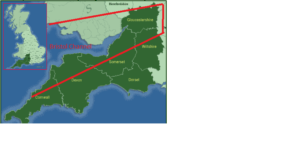 These areas have historical ties to Bristol (see map below). I selected this as my first region since Bristol merchants had some of the earliest connections to Newfoundland. John Guy’s colony at Cupids , Conception Bay was established in 1610 as a partnership between Bristol and London merchants. In the late 18th century several prominent Newfoundland merchants including John Noble, Jeremiah Coghlan and John Newall had their home base in Bristol. My first report in this section explores the life of John Newall, merchant of Bristol and Harbour Grace.